It's not all hard work and no play! 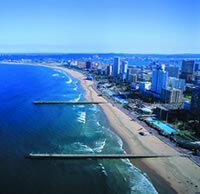 A varied selection of day tours in and around Durban will be available for AORTIC 2013 delegates and partners who find that they have a free moment during the conference week. From the dramatic peaks of the exquisite Drakensberg mountain range to traditional Zulu villages, magnificent game reserves, historic battle sites and the warm Indian Ocean lapping onto wide, sandy beaches, KwaZulu-Natal is a tourist's paradise. Let Hylton Ross help you discover the treasures of this region. Let us introduce you to Durban, a multicultural City shaped by a complex collaborative history involving the early colonial settlers, the indigenous Zulu population, and the Indian community who arrived as indentured labourers in the 19th century. To call it a city of contrasts is often an understatement. Our tour begins as we travel along the brand-new Golden Mile, the revitalised beachfront promenade which hugs the beckoning beaches of Durban. We move through the City, viewing the majestic City Hall, and enjoying its humorous history! Then we uncover the past's harsh system of labour control at the original offices of The KwaMuhle Museum (closed Sundays). From history to nature, we visit the peaceful Durban Botanic Gardens founded in 1849, a treasure trove of massive trees from Asia, Africa and America, and a magnificent orchid house. Lastly, in harmony with Indian culture and history, you're going local...taste a unique Bunny Chow, traditional 'take-away' food of the Indian community...indeed of all South Africans! We then conclude with a visit to an icon of Kwazulu Natal, the Moses Mabhida Stadium where you will have the option of experiencing the cable car ride (own account) to the top of the Stadium for that phenomenal view of Durban and its surroundings. It's undoubtedly world class! Home to Africa's largest dolphinarium, the globally respected uShaka Marine World entices you to explore the wonders of Africa's vast ocean life. It's a fascinating journey around 30 in- and outdoor themed exhibits, and you won't want to miss the spectacular dolphin, seal and penguin shows. In the aquarium, tank after tank offers a glorious insight into the wealth of South Africa's Indian and Atlantic Ocean marine life, an experience not to be missed. The beauty of the undulating Drakensberg Mountain range is indisputable, but in addition to travelling through such breathtaking vistas, we're going to visit the World Heritage Site of Giant's Castle and the enigmatic Bushman paintings in the vicinity. They're not far, so we set off on foot for a leisurely 3km round hike to the site of the caves to discover this magical legacy of the bushmen (moderate fitness level required). Our guide there will share his knowledge of the paintings which date back 2 000 years. We're bound to have built up an appetite, so we'll tuck into the hearty lunch laid on. Our return to Durban is via the charming Midlands Meander Route, a community of country crafters and farmers who produce quality wares and live enviable country lives. This rural area is extremely appealing, and you'll find it an appropriate way to unwind after this energetic, energising day. Shaka, legendary King of the Zulus! Experience traditional Zulu culture and customs at the largest Zulu kraal in all of Zululand, look into the future with an iSangoma or traditional healer...all this and more, packed into one exhilarating day. We've laid on some traditional Zulu beer for you to sample, while the craftsmen and community who make the spears, shields, beadwork, pots and their huts, open their doors so you can witness their skills and artistry. The Zulu dancers will thrill with their grace and energy, and we've made sure you're treated to a most satisfying lunchtime feast! Come live a day in the life of a traditional community - you'll find it informative and a far cry from anything you've ever experienced! If you want to get to grips with Durban, this full day tour is for you. Ample time to discover the cultural and historical contrasts of this city...before spending time at the world class attraction: uShaka Marine World. Our morning drive takes us along the newly restored Golden Mile, a wonderful promenade which stretches along the beachfront, before we move on to the fascinating KwaMuhle Museum (closed Sundays) where we uncover the pasts harsh system of labour control. We go 'green' thereafter, and head for the lush peace and tranquillity of Durban's beautiful Botanic Gardens, founded in 1849 - the immaculate gardens house a fine mix of African, Asian and American trees, not to mention a superb orchid house. To accompany our exploration of Indian culture and history, it's Indian cuisine on the menu: get a taste of the unique Bunny Chow! We then proceed to an icon of Kwazulu Natal, the Moses Mabhida Stadium where you will have the option of experiencing the cable car ride (own account) to the top of the Stadium for that phenomenal view of Durban and its surroundings. Afterwards, we're going to sit back and be entertained at uShaka Marine World, where the dolphin, seal and penguin shows are not only spectacular, but fun and light hearted too! Welcome to Durban. This magnificent Big Five game park is not only home to 84 species of game, but it's the oldest proclaimed reserve in Africa, world-renowned for its highly successful white rhino conservation programme. A day on safari in the magical Hluhluwe-Imfolozi Park doesn't stop at the thrill of searching for the Big Five, but the hilly terrain offers spectacular views of the Reserve and your camera is going to love it. We've arranged lunch at the lofty Hilltop Camp - or similar - and it'll give you a chance to check how close your bird count has come to the 425 listed birds in the Park. 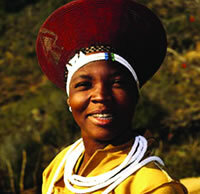 Hluhluwe-Imfolozi Park is Kwazulu-Natal's pride and joy, and after your visit, you'll understand why. * Optional open safari vehicle game drive is available at a surcharge. Historians will love it for sure, but if you enjoy a really great story, the Battlefields tour is for you too - it's both a thriller and a drama. KwaZulu-Natal is rich in Anglo-Zulu war history, where two of the most famous, at times heart-wrenching battles fought between the Zulu and British Armies took place. We visit the eerie battlefields of Isandlwana and Rorke's Drift, and let your imagination paint mental pictures of the battle scenes played out here. Our tour includes lunch, and we wind our way home thereafter through some of the most spectacular scenery in the province of Kwazulu Natal. * A specialist Battlefield Guide is available at a surcharge on request. Note: A passport is required & visa conditions may apply. For those with a sense of adventure, a 4x4 drive up the highest road pass in Africa will certainly provide you with a hefty dose of adrenalin. For your efforts, you'll be rewarded with its breathtaking scenery. From Durban, we drive through the green hills of the Midlands towards the little country town of Underberg. Here, our 4x4 vehicle awaits us...the only form of transport equipped to tackle Sani Pass! You'll have your passport stamped as we enter the Kingdom of Lesotho, and we stop at a nearby Sotho Village for you to enjoy a taste of the local culture. Lunch is served at the highest pub in Africa - truly - and, it stands to reason, the views are utterly breathtaking. Once you've recovered your breath, we wind down the Pass very slowly, and wind our way gently back to Durban. You'll certainly have had a day filled with altitude! All tours will operate with an English-speaking registered tourist guide. For other language options, please contact the tour suppliers in advance. Pre-payment for all tours is required. 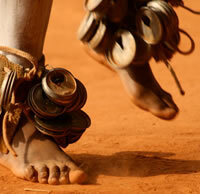 Personalised itineraries can be arranged on request.